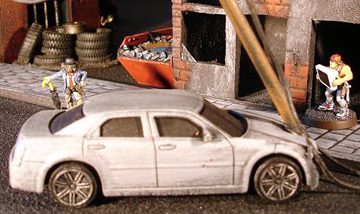 Making scenery for Combat Zone is relatively easy and doesn’t require expensive materials. Since I have been playing Combat Zone I have been making more and more scenery. Although I have enough to fill a table, I can always use more. Here I will present some of my scenery and perhaps inspire you to start building (more) scenery. All of my buildings are made with foam board. This material is easy to use, but does let you make very diverse buildings. 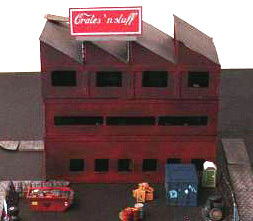 My biggest building is the ‘Crates and Stuff’ factory. When making multi-storey buildings make each level easily accessible by removing all floors above top of it. This makes playing inside a building a lot less of a hassle. 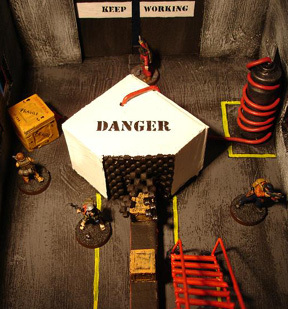 Although having a full interior for your buildings is cool, it is important to realise that you will want to have room for your miniatures. The crate factory has a crate making machine on the first floor the rest is relatively open. A good way to make buildings look a bit more occupied is by decorating the walls with posters, text and graffiti. To paint my buildings I always use texture paint to create a concrete-like wall. I then drybrush this and add further details. I use foam core to create brick walls, etc. Just remove the paper covering and with a blunt pencil press a brick structure in the foam board. Washes and drybrushing brings out the detail. 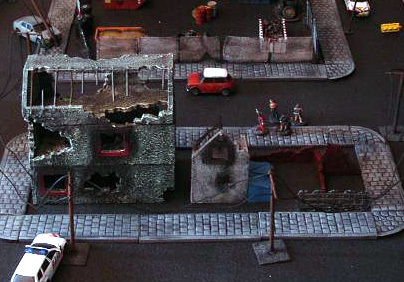 Buildings are an important part of Combat zone scenery, but to create a lively town, you’ll need other stuff. Pavement is a very nice addition to a city and there are many ways to make it. 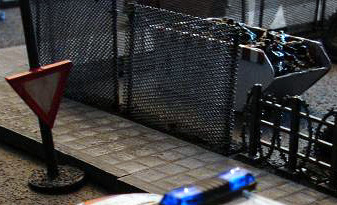 There are a lot of materials which are very useful to make small scenery objects. The first is plastic card. I made three big dumpsters from plasticard. I first cut out a piece of foam in roughly the right size. I than made a template for the sides of the dumpster, making sure they would each fit on one credit card sized piece of plastic. I used the templates to cut out multiple sides for each dumpster and then stuck them on the piece of foam. 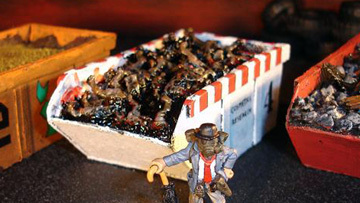 To fill the dumpsters, pour a large amount of glue on the foam and put stuff in it. I chose to fill one container with rubble, consisting of small stones and pieces of toy cars. Another container I filled with sand from the beach and the third container I filled with small plastic dead dogs. To paint them, I simply sprayed the containers black and drybrushed them in different colours. Lastly I added details and some graffiti. Another great material is mesh. Look for splatter screens, which were intended to place over your frying pan to stop grease from splattering out of the pan. Some are made of steel that was stretched to get the right shape. These are made from one piece and will not fall apart after cutting. This material is great for making chain linked fences, which can provide interesting obstacles in combat zone scenarios.